Cannabis-testing laboratories have the challenge of removing a variety of unwanted matrix components from plant material prior to running extracts on their LC-MS/MS or GC-MS. The complexity of the cannabis plant presents additional analytical challenges that do not need to be accounted for in other agricultural products. Up to a third of the overall mass of cannabis seed, half of usable flower and nearly all extracts can be contributed to essential oils such as terpenes, flavonoids and actual cannabinoid content1. The biodiversity of this plant is exhibited in the over 2,000 unique strains that have been identified, each with their own pigmentation, cannabinoid profile and overall suggested medicinal use2. 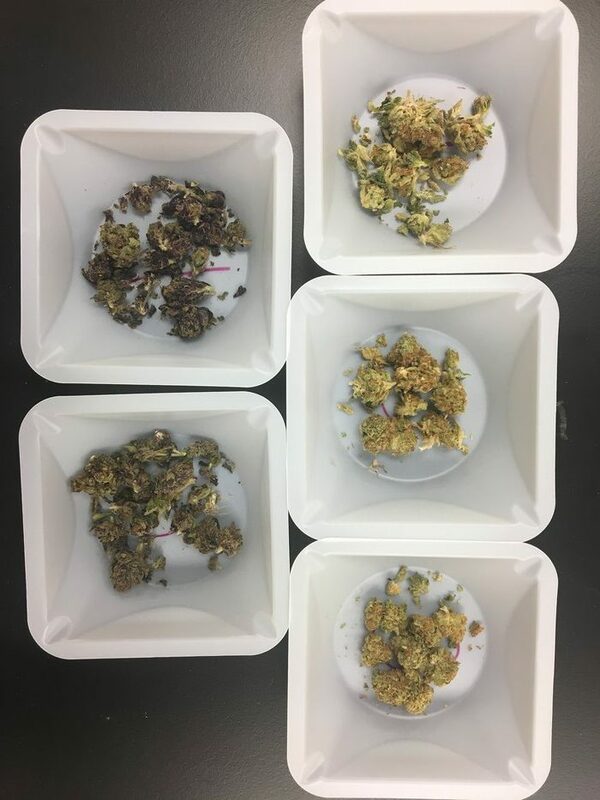 While novel methods have been developed for the removal of chlorophyll, few, if any, sample preparation methods have been devoted to removal of other colored pigments from cannabis. Cannabis samples from four strains of plant (Purple Drink, Tahoe OG, Grand Daddy and Agent Orange) were hydrated using deionized water. Following the addition of 10 mL acetonitrile, samples were homogenized using a SPEX Geno/Grinder and stainless steel grinding balls. QuEChERS (Quick, Easy, Cheap, Effective, Rugged and Safe) non-buffered extraction salts were then added and samples were shaken. 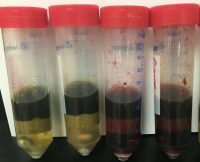 Following centrifugation, an aliquot of the supernatant was transferred to various blends of dispersive SPE (dSPE) salts packed into centrifugation tubes. All dSPE tubes were vortexed prior to being centrifuged. Resulting supernatant was transferred to clear auto sampler vials for visual analysis. Recoveries of 48 pesticides and four mycotoxins were determined for the two dSPE blends that provided the most pigmentation removal. 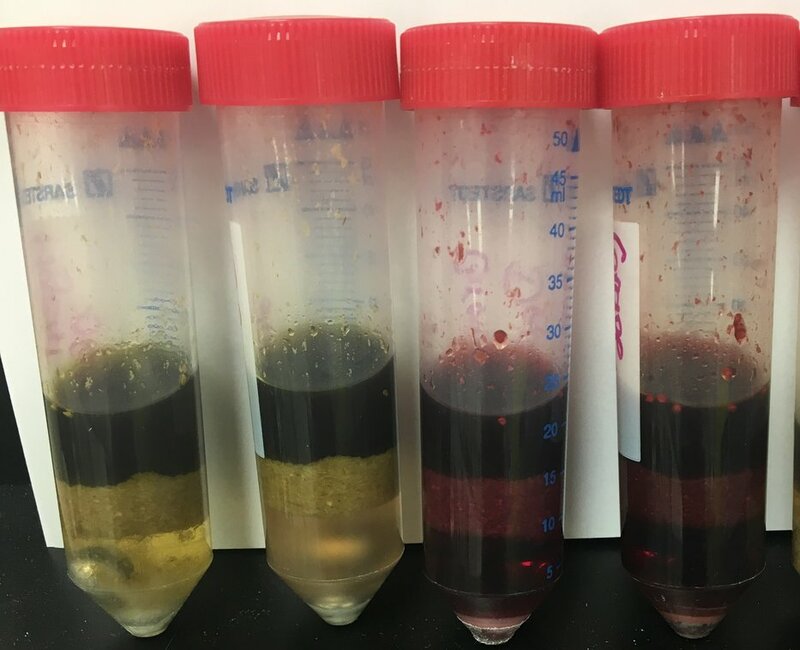 Based on the coloration of the resulting extracts, blends A, F and G were determined to be the most effective in removing both chlorophyll (all cannabis strains) and purple pigments (Purple Drink and Grand Daddy). Previous research regarding the ability of large quantities of GCB to retain planar pesticides allowed for the exclusion of blend G from further analyte quantitation3. The recoveries of the 48 selected pesticides and four mycotoxins for blends A and F were determined. A blend of MgSO4, C18, PSA and Chlorofiltr® allowed for the most sample clean up, without loss of pesticides and mycotoxins, for all cannabis samples tested. Average recovery of the 47 pesticides and five mycotoxins using the selected dSPE blend was 75.6% were as the average recovery when including GCB instead of Chlorofiltr® was 67.6%. Regardless of the sample’s original pigmentation, this blend successfully removed both chlorophyll and purple hues from all strains tested. 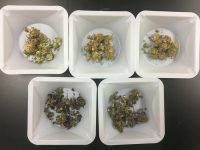 The other six dSPE blends evaluated were unable to provide the sample clean up needed or had previously demonstrated to be detrimental to the recovery of pesticides routinely analyzed in cannabis. (3) Koesukwiwat, Urairat, et al. “High Throughput Analysis of 150 Pesticides in Fruits and Vegetables Using QuEChERS and Low-Pressure Gas Chromatography Time-of-Flight Mass Spectrometry.” Journal of Chromatography A, vol. 1217, no. 43, 2010, pp. 6692–6703., doi:10.1016/j.chroma.2010.05.012.